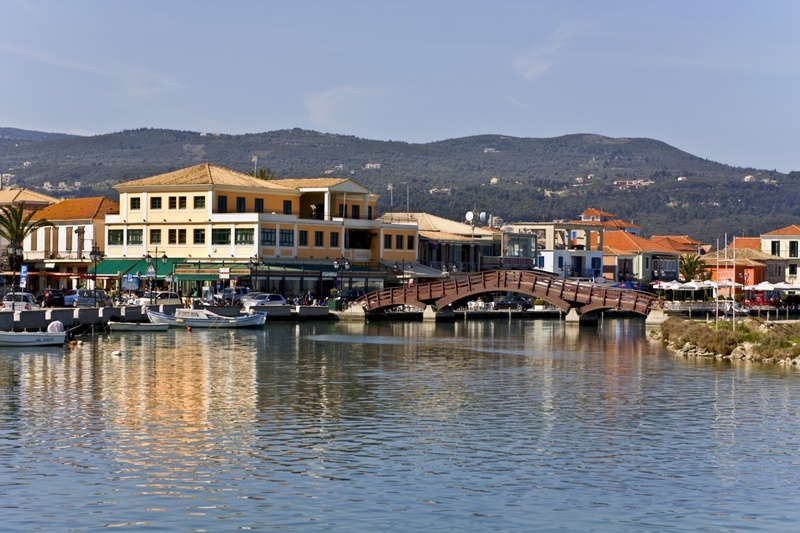 Lefkada Town is the capital and has approximately 8000 residents who live mostly on tourism and agriculture. What is typical of Lefkada Town is the unique architecture. It has nothing to do with the ordinary white-washed houses and buildings you come across on most of the Greek islands. The Town suffered from two major earthquakes which destroyed almost the entire island. Generally speaking, the area is very prone to earthquakes and therefore the authorities in combination with the locals had to take measures to prevent such disasters and to protect their property. When the town was destroyed by the earthquakes of 1948 and 1953, the buildings were re-built from scratch and that is what lead to its distinct architecture. This time the buildings were made of wooden skeletons and coloured sheets of metal. It is not the typical Greek island architecture and you will certainly not find such buildings in the mainland either. Be open-minded, embrace the local aesthetics, and the welcoming nature of the locals together with the beauty of the nature will reward you! You can have a first glimpse of how verdant the island is at the entrance of the harbour where there is a small square, full of beautiful evergreen trees. The Town of Lefkada is also the home of the Lagoon of Lefkada, an environmentally significant area, protected by the Natura 2000 network. It has also been recognised as an international wetland, protected by the Ramsar Convention. There, you could go bird watching and become one with nature while you watch rare species of birds, such as Eurasian coots, little egrets, great cormorants, wild ducks, swans and black-winged stilts. You could also visit the old olive groves in the north part of the Town. These olive groves are as ancient as the history of Lefkada. There had already been 8500 olive trees on the island when the Turks invaded. What is also definitely worth visiting is the area of Gyra. It is very close to the Town and surrounds the north part of the lagoon. The narrow strip of extremely white sand makes the scenery truly magical. Other beaches near the Town are those of Kastro, Myloi – where you can go kite surfing – and Ai Giannis. Some of them are shingly and others sandy, but all of them have crystal clear waters ideal for swimming and water sports. On the road near the bay, the area is full of cafes and bars to enjoy lovely evenings on the waterfront watching the lights of the yachts at the yacht marina. For a relaxing walk, head to Ioannou Mela Street, the pedestrian street with the attractive arcades and the corrugated fronts of shops and houses. For more sightseeing, there are a lot of churches on the island, but unfortunately very few monuments survived the earthquakes. The main square of the Town was named after the 18th century church that is located there, called Agios Spyridon. Other churches from the 17th and 18th centuries are the churches of Agios Nikolaos and Agios Dimitrios. They are ornamented with fine work from the renowned Ionian School of Painting. If you would like to become more acquainted with the history of the place, visit the archaeological and the folklore museum of the Town. The Fortress of Agia Mavra and the convent of Panagia Faneromeni or Lady of Lefkada should not be missed! The first was built by the Franks in 1300 to protect the Town from the pirates and has views of the protected wetland and its rare fauna. The latter has a spectacular panoramic view and is dedicated to the patron of Lefkada. To move around the Town isn’t very difficult, even though buses are a bit infrequent. Silver taxis and rented cars are available and quite convenient for the generally well-maintained road system of the island. If you want to remember your first visit to an island using your car, then travel to Lefkada from the Greek mainland! Find information about selected Hotels, apartments and rooms in Lefkada Town to choose the perfect place for your accommodation.